It's been just about 10 months since an LG device has showed up in "IRL." That was back in January, when our Canadian editor Jon Fingas took the Optimus G for a spin on Rogers. Now he's back to test the G2, though he's still waxing a bit sentimental about the ol' G. So how does it stack up? Let's see. I have a soft spot for LG's Optimus G. While its Nexus 4 counterpart ultimately stole the spotlight, the Optimus had better battery life and an easier-to-hold design. For that reason, I was eager when I gave the G2 an extended test earlier this fall. Would it remind me of everything I liked about its ancestor, or just make me yearn for the closely related Nexus 5? I've had the opportunity to try the G2 here in Canada to find out. From a pure hardware perspective, it's just about right. The 5.2-inch screen is beautiful, if prone to oversaturated colors. Virtually everything feels quick thanks to that Snapdragon 800 chip, and the LTE speeds on both Rogers and Telus are brisk. Most of all, though, I've been taken by the long battery life. It's one of the few regular-sized smartphones that can last through one of my typical days out and about, even when I'm snapping an album's worth of photos. However, it's clear that LG pushed the software customization one step too far. There are simply too many features that accomplish too little, or even get in the way. By default, the notification bar doesn't leave much room for... well, notifications. Saving apps through Slide Aside is redundant when there's a multitasking menu, and the keyboard is ever-so-slightly awkward. LG also shares Samsung's love of camera- and sensor-based features that look good in a TV ad, but aren't very useful in practice. I'm not so concerned about photobombers that I'd ever use Shot & Clear, for instance. I can't help but liken the G2 to a high-end PC loaded down with bloatware. The hardware underneath is powerful, but you'll have to disable and customize a lot of the software to see the potential. LG doesn't need to use stock Android. The company just needs to tone things down and focus on a few truly useful features, rather than barraging users with novelties. 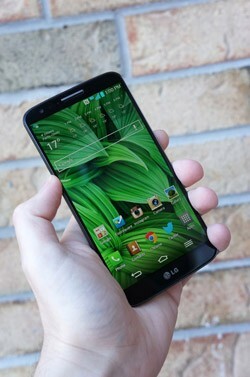 I wouldn't mind if someone gave me a G2 as a gift, since it's still a fine phone. However, I wouldn't buy one when the new Nexus is at hand -- Google's device has all the performance of the G2 without the overburdened interface.